Colourful flowers, birds and fish - look out for humpback whales! This self-guided walking holiday explores the quintessential island paradise of Bermuda, a sub-tropical gem, seemingly adrift in the North Atlantic Ocean. Warmed by the temperate Gulf Stream, Bermuda is a stunning archipelago of 181 islands and islets, the eight largest of which form the fishhook-shaped mainland. The oldest British colony, this tiny treasure trove is packed with history and natural beauty. Famed for its stunning turquoise waters in a whole rainbow of blues, incredible pink sands and coral reefs home to hundreds of colourful fish, Bermuda is a beach-lover's heaven. Beyond the postcard-worthy bays, the islands offer a lush interior alive with a multitude of birds and flowers, making it perfect to explore on foot. As Mark Twain commented, 'You go to heaven if you want. I'd rather stay here in Bermuda'. You'll stay in a deluxe ocean view room (with either balcony or terrace) at the exclusive 64-room 4H-rated Coco Reef Hotel on the edge of the best private beach on the island and just 15 minutes from the capital, Hamilton. Meals are taken either in the elegant Cafe Coco signature restaurant or on Tamara's Terrace overlooking the pool. Arrive at your hotel in time for dinner overlooking the ocean. Today's route begins at Somerset Bridge, the world's smallest drawbridge, to follow the Railway Trail lined with unusual screw palm and cedar, reaching C19 Fort Scaur, with stunning views to Hamilton. Onwards to sleepy Somerset Village for lunch by pretty Mangrove Bay, you then follow a coastal track to the Royal Naval Dockyard at Bermuda's most westerly end. Maybe visit vibrant Hamilton before meeting Tim Rogers at the hotel who will talk you through the suggested programme for the rest of your walking week. You start the day in charming St George, a UNESCO World Heritage Site. There's time to explore the tangle of colourful streets and pretty harbour, before a dazzling path lined with prickly pear and casuarina leads to Gates Bay where Sir George Somers first came ashore in 1609. You continue along a herb-scented coastal track to Ferry Reach, with its C17 forts and Corsican tower. 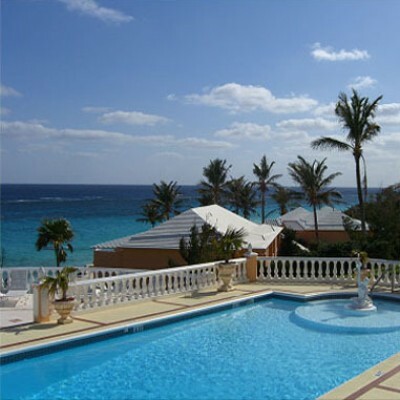 Coco Reef enjoys one of the best locations in Bermuda, right on the edge of one of the most stunning beaches of the South Shore with pink sands, several reefs and quintessentially Bermudian azure waters! The hotel has 64 rooms divided between four pastel coloured buildings set over two floors. The rooms have a 'tropical' feel utilising traditional Bermudian colours and are decorated with wicker furniture and floral furnishings. All have private facilities with bathtub and shower as well as a balcony or terrace too equipped with furniture, mostly with good ocean views. All the rooms are identical; the only difference is location. The Ocean View rooms are located at the top of the hill on the same level as the Lobby building and the beach front rooms are located at the bottom of the hill overlooking the main lawn with a staircase down onto the beaches. They offer panoramic views of the ocean and beach. Every room in both categories has a view of the ocean from the bed itself! Room upgrades: Beachfront Double Room. The beach front rooms are located closer to the beach than the standard rooms. Transfers included from Bermuda airport at 18:30, and back to Bermuda airport at 17:45. Very enjoyable holiday Jan/Feb 2019. Great weather apart from 1 day of thunderstorms, not at all humid and lovely temperature for walking. Hotel was just as described, with excellent food. Worth bearing in mind that the hotel is very quiet in winter (we had the breakfast room to ourselves most days, and just a couple of other tables at dinner). As previous reviewers have said, this is more of a sightseeing holiday on foot, but very enjoyable. The walks vary in length (and are very flat) and some are quite long (we managed 30,000 steps one day) but there's lots of flexibility with the local buses (which work very well). A good trip for us to get away from the UK winter, followed by a few days in Miami on the way back. Bermuda is beautiful and interesting if you like history. There wouldn't be time to see everything and hike every day. I chose the things I wanted to see and organised my walking around that. The holiday was very good the free bus & ferry pass excellent,we found the notes accurate the map also good but large,because we are getting older we reduced some of the walks which worked well,allowing more swimming time. The people were very friendly and would stop if we looked lost. Overall a very good holiday well done Headwater. When we booked I was looking for maybe a different way to Bermuda I got no help from the sales girls, so we stayed with your holiday guide. For UK travelers, make sure they take a lot of money. At least 3 times as expensive as this country. In our hotel, when not 'happy hour' £ 14 a glass...beer £12 for a small bottle. Therefore forced to go to a small supermarket. Cheapest bottle of wine £11. even then. A very good holiday but in all honesty Bermuda is not really a walking destination. Once you accept that this is really a sight seeing holiday on foot and that most of the walking will be on roads it's fine. Fabulous coast and beaches and excellent accommodation. Bermuda is a delightful place and absolutely ideal in November: lovely climate, beautiful beaches, historic interest, luxuriant vegetation, helpful people, more British and Britain. There is even a Marks & Spencer. and an excellent hotel. Bermuda is slightly off the beaten track, the air temperature is good for walking but also swimming etc. Bermudans are exremely friendly and not once did we feel threatened or have to stop people trying to sell us goods. Bermuda is a first class holiday destination. Walking round much of the island is a great way to experience the culture of the island first hand. Headwater enabled us to do that. Really enjoyed holiday in Bermuda. Beautiful island. Excellent walks. It is an EXPENSIVE destination, and therefore (for us) Special, But we don't regard Coco Reef as meeting 'special'. Fabulous location, but it's a bit tired, could do with freshening up, and no apparent sign of management involvement- maybe that's the Bermudian way? Furthermore its close to a Bermuda College, and during our stay a group of students were also resident, who although decent kids, kept different hours to us, and on 2 occasions kept us awake into the early hours. I don't think hotel management is doing itself any favours by mixing them with holidaying guests. Restaurant food excellent, but menu needs regular update, a bit 'samey'after a week. Thank you for taking the time to complete your post-holiday feedback and for your constructive comments. It was great to see you enjoyed your holiday overall. We were however sorry to read there were areas within the hotel that did not meet with your expectations. Firstly, we can advise there is a new Hotel Manager in place; she has already made noticeable improvements to the feel of the hotel and is keen to work with us to ensure our customers have a great holiday. The latest customer feedback is positive and a good reflection of the improvements she is making. Bermuda is friendly, beautiful and relaxing. We followed all walks but one and wished we had had longer to do more (the walks didn't leave enough time for visiting museums etc). Coco Reef was a lovely place to stay. Thank you, Headwater: we would never have thought of visiting Bermuda if your brochure had not suggested it as a base for a walking holiday, and we would have missed a treat. A delightful destination, with friendly and helpful people, a comfortable hotel in an attractive beach-side setting, some lovely walks along the old railway trail and the stunning coastline, and a range of places to visit and learn about Bermuda's fascinating history, customs and society. The accessibility of all parts of the island and its excellent (and entertaining) bus and ferry service make it easy to 'pick and mix' elements of the recommended walking routes. We made full use of this flexibility so we could spend time in some of the museums and historic houses that help bring Bermuda's rich history and culture to life, as well as exploring the various nature reserves that feature in some of the walks. Highly recommended (and we found May a perfect time to go - warmth and stunning flora). Beautiful location, average breakfasts, excellent evening meals although limited menu. Walking in Bermuda was described well in the brochure and ideal for those of us who don't want a sun/beach /pool holiday. The bus/ferry service was excellent for getting around either before walking or after, we sometimes split the walk over 2 days as we stayed an extra 3 days and decided that to go to the end point (often a sightseeing place) and walk back, rather than start by walking. Everyone was very friendly and willing to show us the way if we were unsure. The maps and the guide notes were good. We added in going on the glass bottom boat and swimmimg with the dolphins as extras but readily available. We really enjoyed our holiday with you. We didn't meet our rep which was unfortunate ( he was unwell) . I had hoped that he may contact us later in the week. We followed all the walks which we enjoyed. We both thought that the Island was rather more suburban than rural. Really enjoyed the bus trips and Bermuda. Costa Rica was a rushed experience rather than a holiday; there was too much road walking! The walking aspect of the holiday was great but the Coco Reef was a disappointment. The hotel needs to be refurbished and better maintained and the main hotel receptionist who was on duty during our stay was disinterested to the point of rudeness. Bermuda in the winter is an ideal walking holiday destination, but visitors need to be ready for a virtually empty hotel with a skeleton staff. Thank you for taking the time to provide your post-holiday feedback, it was great to see that you enjoyed the walking aspect of your holiday. Although, we were surprised to read of your disappointment with the Coco Reef. Ordinarily this hotel receives positive feedback. However, we realise that we cannot afford to let our high standards of accommodation and service slip, and have discussed your feedback with the hotel manager. He would like to offer an apology for the poor service you felt you received from the reception staff, and assures us this will be addressed immediately. There are also plans in the pipeline to replace the soft furnishings in the rooms and public areas. Whilst we realise this does not impact on your holiday, we hope that it goes some way to show we take the feedback we receive seriously. Walks were slightly different to those in brochure, not a problem, but needs up dating. Very relaxing and enjoyable holiday. Bermudan people are extremely friendly and helpful, why can't we all be like that? Buses and ferries very reliable. Hotel looked a bit dated and the food was poor on Tues and Thurs - Island and Buffet night, so we went out as had read the headwater previous visitors book comments. Other nights the food was fantastic. Beach is rather small could be busy at peak times. Ran out of towels on 2 occasions. Can be very busy when the cruise ships are in. Overall, the walks were longer than advertised but very enjoyable. We had a great time. Lovely way to see Bermuda and some bits that others may not get too - Coopers Island. Walking pretty much as described, care needs to be taken on switching from rail track to road and vice versa� Avoid multiple bus changes at weekends as they run less frequently. The hotel has large parties of sporty types out of season, try to find out if any are there while you plan to stay, if there are, don't book. They are loud, boorish and their behaviour is totally unacceptable. Don�t expect the shop to be open out of season. Do take the ferries, though only one runs out of season. Do explore apart from your route notes, there are many other nature reserves to visit and also ramble around headlands, Simson's island particularly rewarding. The friendliness of the local people and the great hotel staff contribute to making this a really special destination and the stunning scenery everywhere is overwhelming. The walking is pretty good but it especially suited us because there are good places to visit including the Aquarium, the Underwater Exploration Institute, the Museum at the Dockyard and the town of St George. The food at the hotel was very good quality and value as was the combined bus/ferry ticket which takes you everywhere on the islands. You can minimise the waiting times for the transport with some careful pre-planning. And you can walk straight from the hotel onto the sandy beach and swim in the warm ocean, even in February. We found the route notes were a times lacking in information, distances from one point to the next for example, and at others over complicated when there was a perfectly good way mark to guide us. The hotel was excellent, very friendly, the food was very good, I did not repeat a dinner main course selection in the 11 days we were there! Walking is a great way to see a country, and Headwater provides a good service for doing so. Selected Sundays from 28th Apr 2019 to 24th May 2020, for 7 nights. All dates are subject to availability, please contact us to check. Due to the tailor-made nature of our holidays, we need a little more information in order for us to check availability for Islands of Bermuda Walk. Simply complete the form below and a member of our sales team will contact you (when it's most convenient for you) to provide availability information, travel options and an accurate price. Of course there's no obligation, but if you do wish to proceed with a booking they will be on-hand to assist you throughout the process.